Alexander Radulov is ready for his return to the Nashville Predators. The forward, who left the team in 2008 to play in Russia, tweeted Tuesday morning from his personal account (@RADUL22) that he was on a plane heading to New York and then Nashville. He also took a photo of himself on the plane. 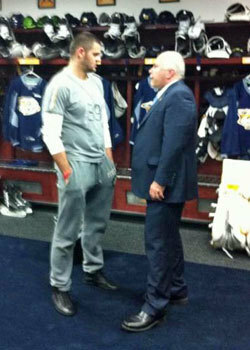 Radulov and coach Barry Trotz met after Tuesday's 6-3 loss to Edmonton, and the Predators announced that Radulov and GM David Poile would meet with the media before Wednesday's practice, with Poile presenting Radulov with his jersey. Radulov has been rumored to be coming back to the NHL -- and the Predators -- for several weeks. The speculation intensified last week when the League said that Radulov would not have to pass through waivers to join the Predators for the rest of the regular season and the Stanley Cup Playoffs. Poile issued a statement Monday regarding the Radulov affair. "We have been in contact with Jay Grossman, Alexander's agent, throughout this process of trying to return Alexander to the Predators and the NHL," Poile said. "Though the complicated process has yet to be concluded, every indication is that Alexander will be returning to Nashville in the near future. "We do not anticipate having any further update on this process until (Tuesday), at the earliest." The earliest Radulov could play is Thursday, when the Predators visit Pittsburgh. Widely regarded as the best player not playing in the NHL, Radulov scored 44 goals in two seasons with Nashville before he left for the Kontinental Hockey League in 2008. He still has one year remaining on his entry-level NHL deal. If he plays for the Predators this season, he will burn the final year of that commitment and will be eligible to become a restricted free agent July 1. Radulov had 25 goals and 63 points in 50 games this season for Ufa Salavat Yulayev, which just ended its KHL season. Trotz said Sunday night that he would welcome the return of Radulov to the Predators, who are still in a battle for first place in the Central Division and the top-three seeding that goes along with it. "It would be huge," Trotz said. "It would probably put a lot of pressure on guys. He's a world-class player. He's a world-class talent. The one thing that Rad does is, Rad is passionate about winning and passionate about scoring goals and being a top player."